It may seem strange for some people, especially living here in the United States, but Amanda and I have never had a proper Christmas tree in all the years we’ve been married. The argument has been that we don’t have enough space and that I’m a bit of a Grinch and not a huge fan of the holidays. I know that my right to veto anything my wife wants is rather limited and should only be reserved for something I really care about. Our first tree is just one of those compromises that come with being married. I had always been proud of our “Peanuts” Christmas tree, a small wire tree that looks like the one that Charlie Brown had in the Charlie Brown Christmas special. Amanda, on the other hand, had always wanted a tree of a proper size. 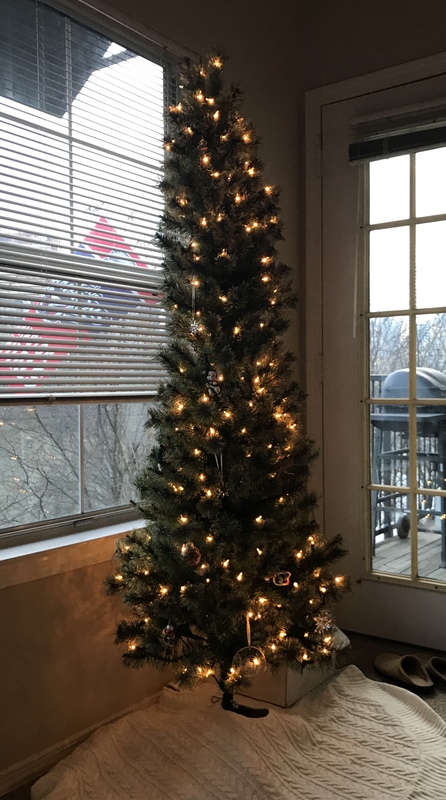 She “asked” (and it’s in quotes because it’s more like she told me) if we could get a narrow artificial tree for our apartment. She pulled out all the stops, even noting that our cat, Storm, always loved to lay under her parents’ tree when she was just a kitten. I felt like when a kid asks for a puppy and the parent says “it’s your responsibility to feed it” and I left the assembly and decorating to her. So for the first time more than a decade, a Christmas tree stands in the corner of my home. I promise there will be something more interesting than a spousal debate on the purchase of a seasonal artificial conifer in the post next week.